P.S. 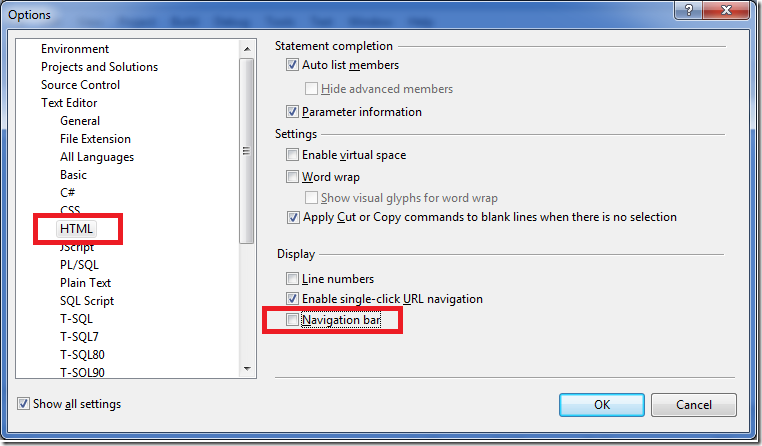 By default with VS 2010 (starting with Beta2) we are hiding the navigation bar when in HTML mode with the standard web profile – you can then turn it back on via Tools->Options if you find it useful. 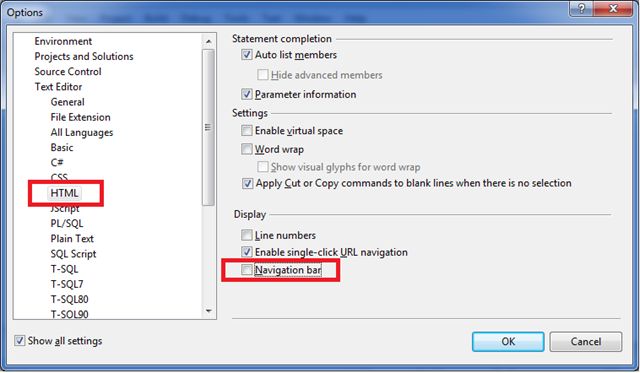 VS 2010 also has a new optional "code optimized" web profile as well that turns off all toolbars, dropdown and HTML designers. Great tip! It is useful when I develope apps with notebook PC. 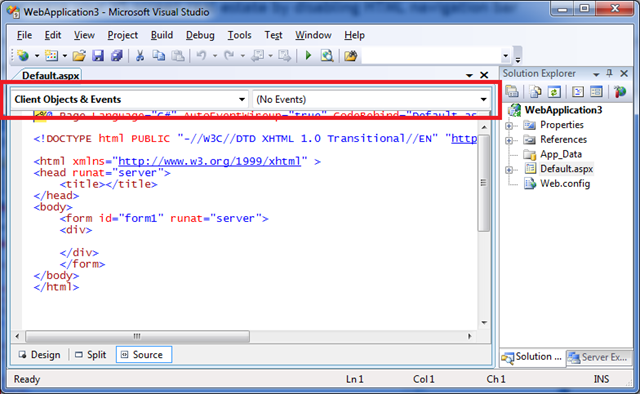 Scott, while I agree this frees up some real estate in HTML mode, the issue I run into is this that after a while, flipping between aspx pages and cs pages, a delay starts to form with the adding and removing of the navigation bar (Not to mention other tool bars). In the past I've found it smoother to set the tool bars and navigation bar to the least common denominator settings, and suffer through lack of space. 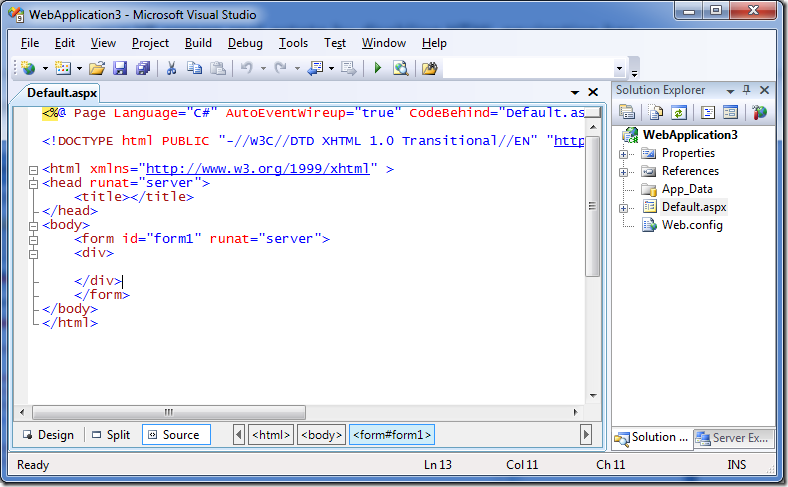 Hopefully this will be improved in VS2010. Nice to know along with full screen. Everybody remembers Sara Ford's VSTips #100 content was similar to this. 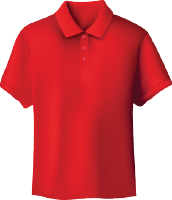 What about a Shirt-Alt-Del to make it full screen? If you are using Visual Web Developer Express, you have to check the "Show All Settings" checkbox in the bottom left of the Options window in order to see this option. Is there a way to disable the html nodes iet(html>> body.. form#form1)at the bottom of the editor beside the design source and split buttons. I'm not sure if you noticed but mousing over these nodes using VS 2008 in 64 vista causes your mouse to magically teleport to the top left corner of the applicationon... Very annoying when you are trying to get to the windows taskbar. Good tip to free up space occupied by something you would hardly use. Very good. Would like to use this feature immediltely I saw this. Simple but very nice one. Thanks. That was a nice one. 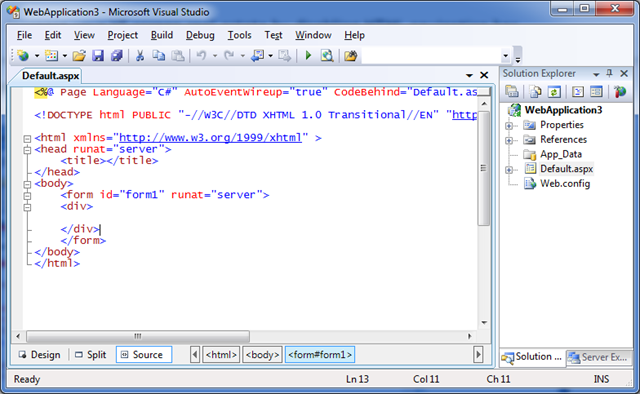 I'm currently using VS 2010 Beta 1 for tests and little EF 4 developments. Can you please tell me when the Beta 2 version will be available? Nice tip thanks, P.S. I never used line numbers its so unneccessary just -G to get to a line when it appears in an error! i always wondered what those dropdowns were for, thanks! I’m hooked! Can’t wait for the next update! Thanks for the tip. Can you please provide me the Tip to hide Design/Split/Source tab as well. for me I relly time my code. I do not want to have design/split views. the problem with them is VS 2008 is taking too much time to open my aspx source view as it is it first trying to prepare design view and open the source code. so I want to desable preparing the design. if I open aspx files other than web designer mode I lose the great intellisense for aspx pages. so any thing like only web source mode.